Aligarh Muslim University (AMU) continues to be an irritant in the eyes of anti-Muslim elements. Since India’s independence a coterie with its sick and jaundiced mentality has been working in finding excuses to defame this historic institution. They allege that this institution had created Pakistan and, therefore, the Government should take direct control of it. The fact, however, is that during the days of British occupation when Provisional Government of India was formed in exile in Kabul, one of AMU’s sons, , Raja Mahendra Pratap Singh, was made its President, Maulana Barkatullah Bhopali was made its Prime Minister and a graduate of Darul Uloom Deoband Maulana Ubaidullah Sindhi its Foreign Minister. This coterie also finds it convenient to forget that the very first man to raise the demand in 1921 at the Ahmadabad Session of the Congress for a complete independence for India, Maulana Hasrat Mohani, was the product of AMU. Be it the Frontier Gandhi Khan Abdul Ghaffar Khan or Rafi Ahmed Kidwai; Dr Syed Mehmood or Dr Zakir Hussain, all of them were Aligarh trained. 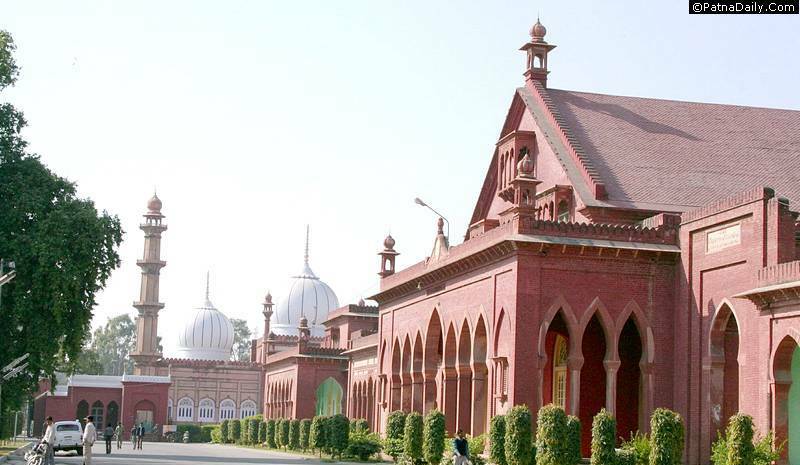 [Sadly] the legal fight for the minority character of AMU is still on, despite the known fact — which India should feel proud of — that the first ever institution of modern and secular education in whole of the Muslim world known as ‘ ‘Madrasa-tul-Muslimeen ’ was established in this country on 24 May 1875; that in February 1877 it became Muhammadan Anglo-Oriental College; that in 1920 it was granted the status of a university; and that generous Muslims helped Sir Syed in every possible manner in establishing this institution. A narrow minded group says that because the government bears all the expenses of running the university, therefore this cannot be a minority institution. They ignore the fact that minority institution has not been given out of a favour or as a charity. According to the fundamental right enshrined in Article 30 of the constitution to help this institution is the responsibility of the government. This should also be borne in mind that Muslims are equal citizens and pay their taxes like any other community. Therefore this is incumbent upon the government that it supports and finances the the provisions for the educational upliftment of Muslims. Only recently this institution was targeted and vilified from all corners because a portrait of Muhammad Ali Jinnah hangs in its Students Union Hall. They found it convenient to forget the fact that Jinnah’s photographs have been displayed in the Rashtrapati Bhavan , Teenmurti Bhavan in Delhi and several other places in India. The unruly and violent scenes created by them during this episode and the role played by electronic media in worsening the situation is highly unbecoming of a civilised and democratic society. In the most recent incident in order to create a new mischief, communalists have once again targeted AMU campus. In the name of patriotism and cultural nationalism they took out a ‘Tiranga Yatra‘ [a rally with India’s tricolour flag]. and raised provocative slogans. Thanks to the wisdom and maturity of some of the students who restrained the students and foiled the nefarious plans of the fascists. When the University administration issued show cause notices to miscreants, local member of parliament came out in their support and started spewing venom mangling the administration. As for their plea that to hoist the tricolour they did not need permission from anyone and as for their assertion where else would they raise the Tricolour if not in India, they should not forget the fact that administration and maintenance of peace has its own demands. By the way, was it not a Tiranga Yatra, organised by Muslim youths of Kasganj, that was attacked [by these self styled nationalist] injuring the participants? It was in this backdrop that this year the administration had to take precautionary measures. Would someone care to ask the BJP MP from Aligarh, whose party is in power in the centre as well as in Uttar Pradesh, why did he not protest against Kasganj administration? The fact is that he is desperately trying to hide behind the Tricolour his inefficiency as an MP but such tricks will not benefit him much. AMU has every right to feel proud of the fact that it has always kept itself away from communalism. Never in its entire history has there been any communal clash (May the Almighty protect it from evil eye) in the campus on religious lines. AMU has given distinguished personalities to this country in the fields of films, sports, literature, journalism, law, culture and politics. These newborn lovers of Tricolour will not even be aware who was it who had made this Tricolour flag? Surayya Tayyabji, the wife of a former Vice Chancellor of AMU, Badruddin Faiz Tyabji, was one of the members of the team that had prepared this flag. Those trying to hoist Tricolour in AMU and [their leaders like] Sateesh Gautam should first go to Nagpur and fly the Tricolour at RSS’ headquarter there because to date Hindutva lovers have not recognised it as a symbol of nationalism. These new friends of AMU may not be aware that the first graduate of this institution Babu Ishwari Prashad was a Hindu. Even today one of the halls of residence, Suleman Hall, has a hostel named after Raja Jai Kishan Das, a close friend of Sir Syed. At his Bismillah ceremony Sir Syed’s grandson Sir Ross Masood was made to sit in the lap of Raja Jai Kishan Das. Instead of defaming it, the need of the hour is to highlight the extraordinary positive role of AMU. Not only has AMU played vital part in the reconstruction and progress of this country but has helped several third world countries through its graduates. Even in the developed world AMU graduates have been performing important roles. To honour and value this great institution is the duty of everyone of us. We are fortunate to have a Vice Chancellor in AMU who is courageous, dedicated, a man of resolve and a lover of knowledge. Not only in the extreme climate of provocation has he been able to restrain the university community and made it maintain erudition, wisdom and perseverance but has also added to the prestige of the institution. Governments and their agents should be grateful to Dr Tariq Mansoor and should help and cooperate with him in protecting the University from the onslaughts of communal elements. The writer is President of Maulana Azad University Jodhpur and Professor Emeritus of Jamia Millia Islamia. Translated by Urdu Media Monitor.com from Inquilab. The ignoramus yum pee from Aligarh is trying to ensure his re-election from Aligarh in the coming election by such nefarious activities.